Mega Niche Media, 9781604870060, 264pp. 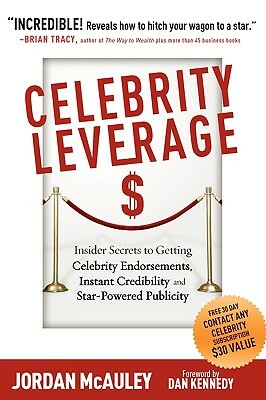 Throughout the pages of Celebrity Leverage, you'll discover creative strategies for getting your products in celebrities' hands, getting low-cost and free celebrity endorsements, linking your business, product or service to celebrities in other ways, and even making yourself into a celebrity in your field. All of these strategies are what I collectively call "Celebrity Leverage." This book is divided into two parts. The first, "Making Your Business Famous," shows you how to get other celebrities to promote your business, your products, and your services. The second section of Celebrity Leverage, "Making Yourself Famous," reveals how to turn yourself into a celebrity in your area, your niche and your field. Along with insider secrets from myself, you'll also hear advice from some of today's top marketing and publicity experts like Susan Berkley, Alex Carroll, Jeff Crilley, Donna Cutting, Mike Esterman, Brian Patrick Flynn, Rick Frishman, Drew Gerber, Jake Halpern, Bill & Steve Harrison, Susan Harrow, Paul Hartunian, Craig Hirschfeld, Dan Janal, Gavin Keilly, Dan Kennedy, John Kremer, Rebecca Lightsey, Ann McIndoo, Brian Reich, Rhonda Rees, Nick Romer, Penny Sansevieri, Yanik Silver, Robyn Spizman, Joan Stewart, Amy Stumpf, Joe Vitale and more.